Because of its parentage, the personality of the Maui Sunset Macaw lends itself to being very friendly, playful, and even talkative... for a macaw! Being a hybrid cross between a Blue and Gold Macaw and a Red-fronted Macaw, the Maui Sunset macaw will have unique influences both in color and in personality. Hybrids have been traditionally bred for color. So being able to attribute personality traits to a hybrid are factors that are quite unknown. The playful Blue and Gold however, is one of the better talkers of the macaws. The smaller Red-fronted Macaw is quite docile and affectionate, but is also known to be quite loud. The Maui Sunset Macaw is a first generation macaw, meaning its parents are two species of naturally occurring macaws. Because they are a mixture of more than one type of macaw, the offspring are influenced by the traits and characteristics of both of its parents. Father's have the dominant gene, so this will generally influence the offspring's coloration and overall appearance. Though the temperament and behavior of hybrids are areas of uncertainty, having parents are that are both quite docile and affectionate macaws, the Maui Sunset Macaw should be a good natured pet bird. They will inherit the gentle nature and the speaking ability of their parentage and can be a very affectionate, inquisitive, and fun pet. All macaws require good socialization and consistent training to make good pets. Scientific name: The Maui Sunset Macaw is a first generation hybrid macaw. It is a cross between a Blue and Gold Macaw Ara ararauna and a Red-fronted Macaw Ara rubrogenys. Description: Maui Sunset Macaws look just like their name, as if colored by a soft sunset. A Maui Sunset Macaw is a cross between a Blue and Gold Macaw and a Red-fronted Macaw. Both parents of the Maui Sunset Macaw contribute to the colors of their offspring, though the father's have the dominant gene and this will influence their final appearance. Mariah, seen in the picture above, had a father that was a Blue and Gold Macaw, with the mother being the Red-fronted Macaw. Sired by a Blue and Gold Macaw you can see the strong yellow frontal area. This is tempered by the red of the Red-fronted Macaw, and the red on the legs is also like that of the mother. The naked facial area and lore is influenced by the Blue and Gold. Size - Weight: Though a full sized macaw, the Red-fronted Macaw is the smallest of the large macaws. Therefore the offspring could vary quite a bit in size ranging from 24 - 34" (61 - 86 cm) though most likely on the smaller side. Social Behaviors: The Maui Sunset Macaw has awesome parents. The Blue and Gold Macaw characteristics make for the best all around personality and a good speaking ability. Add to that the sweet affectionate temperament of the Red-fronted Macaw and you have a wonderful bird. Breeding/Reproduction: This is a rare hybrid and due to the delicate situation of the Red-fronted Macaw (being severely threatened with extinction) it is not suggested that there be intended breeding of this hybrid. It is very important that the Red-fronted Macaws become firmly established themselves. The Red-fronted Macaws are also still quite rare in captivity, but they have proven to be good breeders. They are now beginning to be more widely bred in the United States and hopefully they shall soon become well established. Dr. Jungle says... "We wish Mariah all the best, however the intended breeding of this hybrid is not suggested at this time as the Red-fronted Macaw is severely threatened in its native habitat." Potential Problems: Can be noisy (as can all macaws). Availability: These birds are very rarely available. Finding these macaws for sale may be difficult, as current breeding emphasis is placed on establishing the highly endangered Red-fronted Macaw species. I have been looking for a Maui Sunset Mcaw for a couple of years. If anyone has one for sale or knows of one I would be happy to give you a finders fee of $200.00. My number is 561-309-7111. Thank you. They wont start breeding till may, but we can get them. Today I was promised a maui sunset macaw and the guy sent pictures to me of the bird that I was getting. I sent 600.00 by money gram to the guy. I was told the bird was gonna be to me in 7 to 8 hours. I was told he was giving me a great deal because I didn't want the little lady for breeding just my forever companion. The money included the shipping. Granted I had never had a bird shipped before so I didn't know about it. I got scammed out of the money. After the guy had my money then he said I had to send another 1200 dollars for the insurance for the bird to get to me safely then the money would be refunded back to me. I sent him all of my money that was saved up except for the money for the food. I now have no money and no bird. Now I can't even try to get another sunset macaw because he has my money. I was so excited about having my sweet loving forever companion now I only have a broken heart. Please be careful on giving money out to anyone expecting to get your companion. Don't end up with a broken heart like me. Hi I almost fell for the same scam but from Namibia. I have a Red fronted Macaw Male in Namibia. It is the only one in Namibia. The only place I can get one is in South Africa and it costs R 14.000.00. The transport and quarantine will cost me R 16.000.00 and it is not worth it. 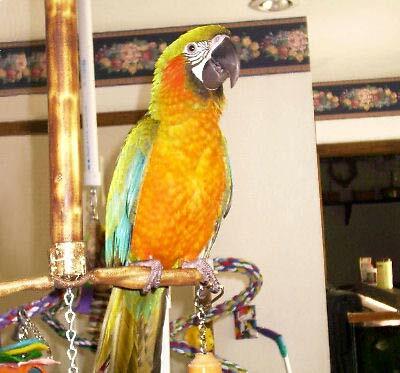 So I am going to put Blue and Gold with my bird to get a Sunset Maui macaw. Don't Ever Ever Ever Wire Money to Strangers to buy something you saw on the Internet. They are all mostly SCAMS !!! Please Parents -- Tell your teenagers and children to beware of SCAM Internet ads and that they should only buy in person from Sellers that you can meet in person. 90% of all Sellers who want you to send them western union money are all crooks and con-artists and you will never, never, never receive whatever it is they were pretending to sell you. -- These thieves pack the classified ad sections of internet web sites with their fake ads selling non-existent pets, cars, boats, and even pretend to be landlords who will rent you houses - (they pull the addresses of vacant homes from real estate web sites). i am so sorry to hear this. I just bought a Catalina Macaw, and I would have been so upset if I hadn't gotten my bird. My Maui Sunset Macaw, Uno, is the sweetest bird in the world. He adores everyone, including my quaker parrot Quincy, my moluccan cockatoo Ray, and my two abyssinian cats, Abby and Annie. Uno especially adores my cats, even better than any of my birds. His favorite food would have to be corn-on-the-cob, green beans, and strawberries. He doesn't exactly have a cage; he instead has a million playstands around the house. I am so glad that Uno, as well as my other birds, are in my life. Hi Sally, Just had questions for you about the sunset macaws. Are they hybrids, And if they are do they live the same age as other macaws? I will be out of work because of my spine and I really want a macaw, my kids will be at school and I have had lots of birds throughout my life but I want to make sure I am getting a loving bird. If you can give me any advice I'd appreciate it. Thank you, Rena. I am having a hard time finding one of these beautiful birds to buy, any advice?? You could just start by calling all the major breeders that advertise in the back of Bird Talk. Or you could look up on the Internet to see if anyone advertises Hybrid birds for sale or again any large breeder. Many breeders feel very strongly that hybrids should not occur. So some breeders will not discuss a hybrid but some will. Be patient and just keep asking. I own & operate a small bird store in Allentown, Pa for the last 26 yrs. One of my breeders has sunset macaws but they are rather pricey, 2000.00 is the price if you're interested. Or you could go directly to a breeder - potentially the one this store uses. Exotic Baby Birds of Englewood Florida breeds these and they sell them for $1500 to consumers directly. Save $500 and buy toys. I have an 8 year old female Maui Sunset Macaw for sale. Tame with me, she is extremely beautiful. If you are interested my email is abc12tree@hotmail.com.